heres the tools you need. start off by wiping the cover down with turps or your cleaning product of choice. this just helps to rough up the surface and cut down sanding time. also the small grinder is great for around the holden logo and in those tricky lines. now for the fun. sand with 400 grit first until smooth. then 800 going across your lines so you can see when its smooth. then 1200 in circles to give it a machined finish. sanding is the most time consuming but most important step. it determines how good the finished product is. then run along the top of your cover, letting the buffer do the work. you don't need to push it hard onto the cover. this could cause burn marks in the aluminum. put more polish on every now and then to get the desired result. 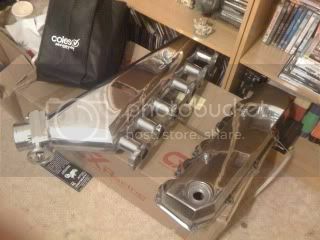 use the miny buffer for the holden logo and the lines. once your happy that you've buffed the pants off it grab your polishing cloth (this is my crappy one, i didn't want to use my nice microfibre cloth lol) and remove the dull polish until it shines! this is just the top done, it gives u the idea though. i'll finish it when i get a chance. Can I ask roughly how long it took? 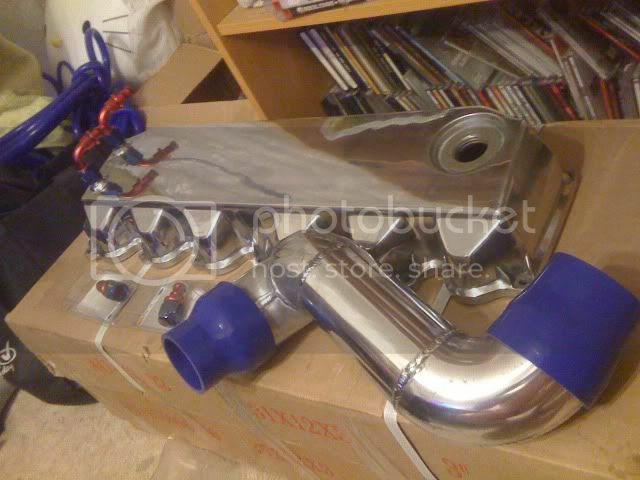 also do you think you could polish the plenum the same way? Or is there a diff way for that? i took it off on friday and spent about an hour on it saturady. and about 2 this morning. thats just the top bit. and yes i plan on doing my plenum the same way. cheers leb vlt for the pat on the back! oh i should of added how to take it off. remove the intake ducting, few clamps and a 13mm underneath as well as two phillips to take the bracket for the leads off. slide the breather hoses off. remove accelerator cable and cruise if you have it. just undo the nut slightly and slide the cable up. open the throttle with your hand and slide the end of the cable out to the side. two 12mm bolts to take the acc cable bracket off. then if i remember correctly just undo the phillips all around the cover and lift off. pop a rag on top of your rockers to protect from the elements. Last edited by duff; 03-10-10 at 18:41. Good write up, it'll look great once it's all polished up. nice write up but just one thing to help you out next time use paint stripper to take off all the paint will save clogging up the sand paper. wow that looks awesome. yeah i'm gonna take it off and have another crack with paint stripper i think. Post some pix Up Of Everyones Work ! 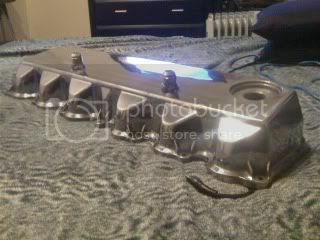 so far i have done my rocker cover, intake manifold upper half and the lower half, the idle air control valve. just a little tip, if you do plan on doing your intake manifold/lower runners, be prepared for some VERY sore fingers and raw fingertips and have ALOT of spare time on your hands. All times are GMT +10. The time now is 09:44.